Come and meet Nicky or Adam at a wedding fair. Nicky and Adam regularly attend fairs in the local area. This gives you a chance to view some of Nicky's spectacular cakes, and maybe try some cake samples! You can browse through the portfolio,Nicky or Adam will be on hand to answer any queries you have, or discuss your ideas for your dream cake. Confetti Cakes will be attending the following fairs throughout Gloucestershire, Worcestershire and the Cotswolds. 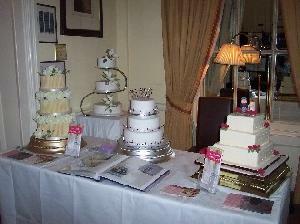 BOOK A NO OBLIGATION CONSULTATION ON THE DAY AND YOU WILL RECEIVE 10% OFF THE COST OF YOUR WEDDING CAKE.